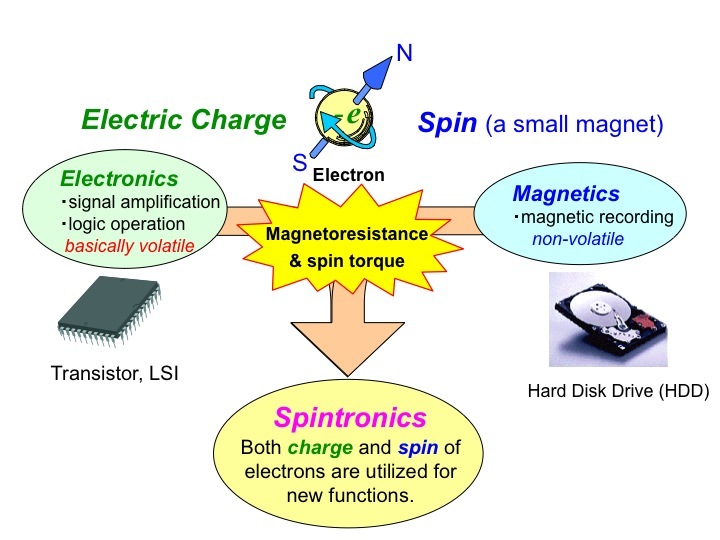 In the Spintronics Center, we have been and will be actively promoting alliances with universities and business corporations on fundamental research as well as developing device applications, taking the maximum advantage of non-volatile characteristics of electron spins in the solid state, and consequently control the spin dynamics. To be specific, based upon our profound expertise in merging the leading edge technologies of spintronics and nanotechnology, which we name as “Nanospintronics”, one of our aims will be to develop what we presume to be the ultimate non-volatile memory device which is speedy, highly reliable, and has large memory-capacity. The device will serve as Green IT Technology product because of its distinctive low power-consuming concept while the computer is in the rest-mode, named as the “normally-off-computer”. 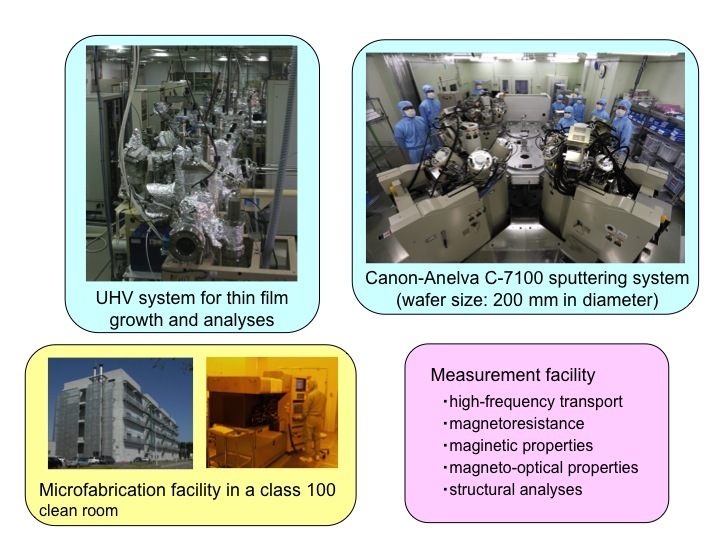 We will also develop “Semiconductor Spintronics” technologies enabling us to inject spins to the desired materials, and further in addition, detect and manipulating their behavior in the solid. This specific new technology will eventually lead us to “Spin Transisitor” device. Much efforts are also been put into implementing the so-called “Photo-spintronics Technology” which is based on the studies of interaction between photons and spins principally inside semiconductors. The technology brings forth a new active device called “Photo-spin Memory” application of which will be the promising candidate for high-grade optical communication network system. 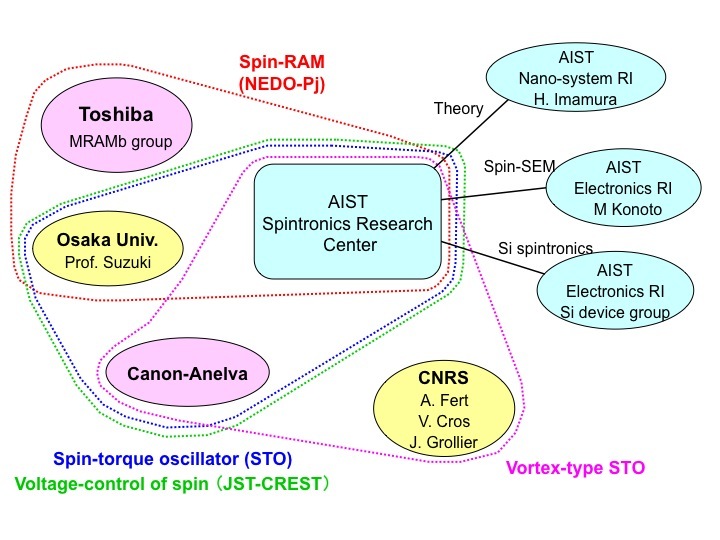 Placing nanospintronics engineering as a core technology, the development of “Spin RAM”, a non-volatile memory with high capacity, high speed, with outstanding reliability will be our primary target. The paradigm as such we believe ultimately replaces memories in the computers to non-volatile devices which eventually will realize the Green Innovative World. 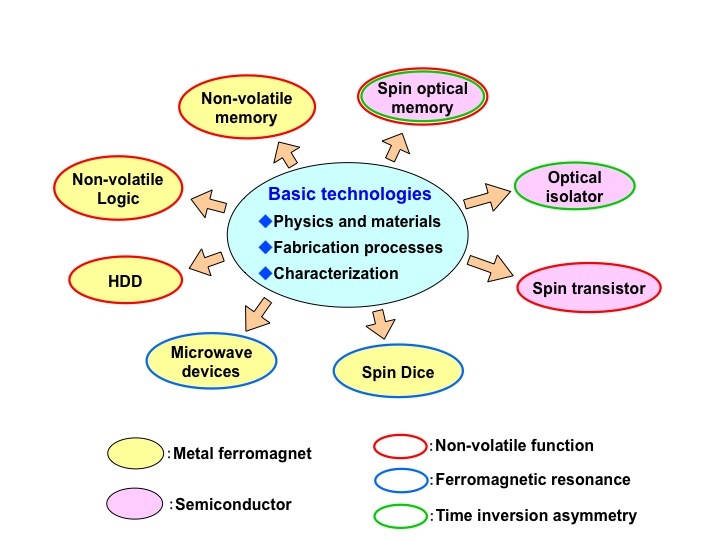 Not only are we taking the advantage of non-volatile characteristics of Spin RAM, since we are keen on the development of memory cells operating stably even under nano-scale size as well, that will definitely break through the limit in semiconductor devices. Much efforts are dedicated to the invention of novel devices which will lead us to innovative discovery in IT technology, such as optical memory, non-volatile switching device, spin-transistor, and high-frequency module, the technologies of which are also included within our range of view.